There are two types of input/output (I/O) synchronization: synchronous I/O and asynchronous I/O. Asynchronous I/O is also referred to as overlapped I/O. In synchronous file I/O, a thread starts an I/O operation and immediately enters a wait state until the I/O request has completed. A thread performing asynchronous file I/O sends an I/O request to the kernel by calling an appropriate function. 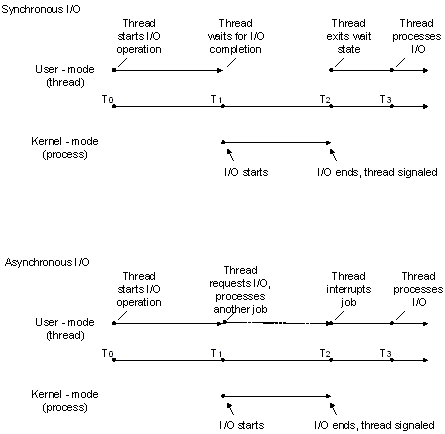 If the request is accepted by the kernel, the calling thread continues processing another job until the kernel signals to the thread that the I/O operation is complete. It then interrupts its current job and processes the data from the I/O operation as necessary. The two synchronization types are illustrated in the following figure. In situations where an I/O request is expected to take a large amount of time, such as a refresh or backup of a large database or a slow communications link, asynchronous I/O is generally a good way to optimize processing efficiency. However, for relatively fast I/O operations, the overhead of processing kernel I/O requests and kernel signals may make asynchronous I/O less beneficial, particularly if many fast I/O operations need to be made. In this case, synchronous I/O would be better. The mechanisms and implementation details of how to accomplish these tasks vary depending on the type of device handle that is used and the particular needs of the application. In other words, there are usually multiple ways to solve the problem. The I/O operation completes (in this example, a data write). An error was made in the call itself (for example, one or more parameters are not valid). Another thread in the process calls the CancelSynchronousIo function using the blocked thread's thread handle, which terminates I/O for that thread, failing the I/O operation. In some cases, this delay may be unacceptable to the application's design and purpose, so application designers should consider using asynchronous I/O with appropriate thread synchronization objects such as I/O completion ports. For more information about thread synchronization, see About Synchronization. A process opens a file for asynchronous I/O in its call to CreateFile by specifying the FILE_FLAG_OVERLAPPED flag in the dwFlagsAndAttributes parameter. If FILE_FLAG_OVERLAPPED is not specified, the file is opened for synchronous I/O. When the file has been opened for asynchronous I/O, a pointer to an OVERLAPPED structure is passed into the call to ReadFile and WriteFile. When performing synchronous I/O, this structure is not required in calls to ReadFile and WriteFile. If a file or device is opened for asynchronous I/O, subsequent calls to functions such as WriteFile using that handle generally return immediately but can also behave synchronously with respect to blocked execution. For more information, see https://support.microsoft.com/kb/156932. Although CreateFile is the most common function to use for opening files, disk volumes, anonymous pipes, and other similar devices, I/O operations can also be performed using a handle typecast from other system objects such as a socket created by the socket or accept functions. Handles to directory objects are obtained by calling the CreateFile function with the FILE_FLAG_BACKUP_SEMANTICS attribute. Directory handles are almost never used—backup applications are one of the few applications that will typically use them. Do not deallocate or modify the OVERLAPPED structure or the data buffer until all asynchronous I/O operations to the file object have been completed. If you declare your pointer to the OVERLAPPED structure as a local variable, do not exit the local function until all asynchronous I/O operations to the file object have been completed. If the local function is exited prematurely, the OVERLAPPED structure will go out of scope and it will be inaccessible to any ReadFile or WriteFile functions it encounters outside of that function. You can also create an event and put the handle in the OVERLAPPED structure; the wait functions can then be used to wait for the I/O operation to complete by waiting on the event handle. As previously stated, when working with an asynchronous handle, applications should use care when making determinations about when to free resources associated with a specified I/O operation on that handle. If the handle is deallocated prematurely, ReadFile or WriteFile may incorrectly report that the I/O operation is complete. Further, the WriteFile function will sometimes return TRUE with a GetLastError value of ERROR_SUCCESS, even though it is using an asynchronous handle (which can also return FALSE with ERROR_IO_PENDING). Programmers accustomed to synchronous I/O design will usually release data buffer resources at this point because TRUE and ERROR_SUCCESS signify the operation is complete. However, if I/O completion ports are being used with this asynchronous handle, a completion packet will also be sent even though the I/O operation completed immediately. In other words, if the application frees resources after WriteFile returns TRUE with ERROR_SUCCESS in addition to in the I/O completion port routine, it will have a double-free error condition. In this example, the recommendation would be to allow the completion port routine to be solely responsible for all freeing operations for such resources. The system does not maintain the file pointer on asynchronous handles to files and devices that support file pointers (that is, seeking devices), therefore the file position must be passed to the read and write functions in the related offset data members of the OVERLAPPED structure. For more information, see WriteFile and ReadFile. File pointer position for a synchronous handle is maintained by the system as data is read or written and can also be updated using the SetFilePointer or SetFilePointerEx function. An application can also wait on the file handle to synchronize the completion of an I/O operation, but doing so requires extreme caution. Each time an I/O operation is started, the operating system sets the file handle to the nonsignaled state. Each time an I/O operation is completed, the operating system sets the file handle to the signaled state. Therefore, if an application starts two I/O operations and waits on the file handle, there is no way to determine which operation is finished when the handle is set to the signaled state. If an application must perform multiple asynchronous I/O operations on a single file, it should wait on the event handle in the specific OVERLAPPED structure for each I/O operation, rather than on the common file handle. The ReadFileEx and WriteFileEx functions enable an application to specify a routine to execute (see FileIOCompletionRoutine) when the asynchronous I/O request is completed.